Fred Melssen and Maarten de Meijer manage Blackboard for FNWI. Probably you know you can ask for a password reset at in case you loose your u-number password. Are you also aware of the possibility to get an activationcode by sms? To enable this functionality please once register two questions at idm.ru.nl. More info on www.ru.nl/idm and idm.ru.nl. We strongly recommend this do-it-yourself method. The course schedule in Blackboard is renewed. Advantages of the new scheduler are better error handling and nicer layout. A difference between the old timetable and the new scheduler is the new one only shows the schedule of the next 30 days. Please use the calendar at the bottom right to show another period. The Grade Center can be slow, especially in courses in which lots of students are enrolled. We're working on installing Google Chrome. The "Video recorded lectures" system of the Faculty of Science has been succeeded by the RU-wide Weblectures. Performance Dashboard: when did students last visit your Blackboard course? Early Warning System: sends you an email when a student fails an exam, might mis a deadline etc. Might come in handy! Three weeks before the course start date the teacher is used to receive an automatic generated mail about Blackboard support. To encourage teachers to read this mail when it contains any news the last modified date is added to the mail subject. the RU Blackboard blog . Tip: In case you search for anything in the blog please start your search here and return to that page for every new search, to be sure to search in the whole blog. 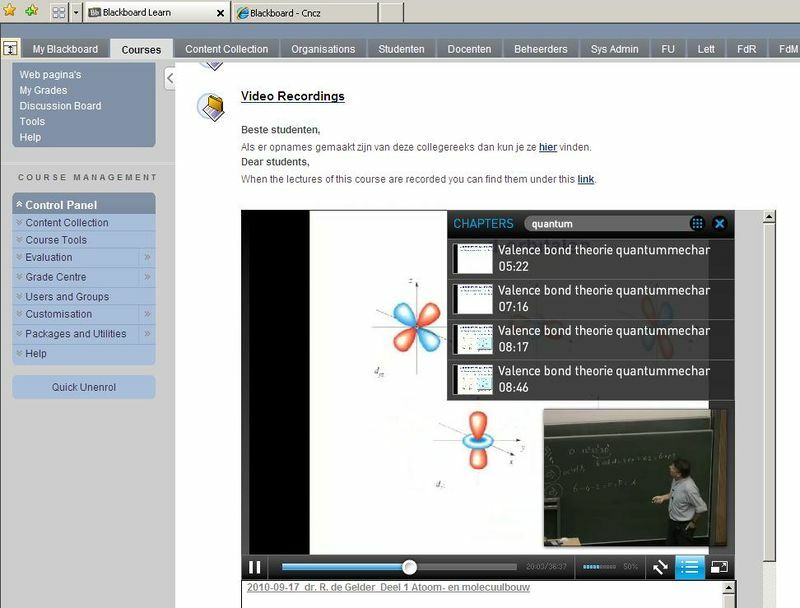 the recordings of the Blackboard 9.1 training in Dutch. In Blackboard we updated the FNWI tab. You'll see some FNWI links in the left pane and some relevant links per education institute in the right pane, in Dutch only. You're kindly requested to send any change effecting course guide or teaching load to your education instition, and not just update your Blackboard course according to it. Please feel free to contact Blackboard support by mail at  in case you would like some help improving your Blackboard courses or you have some problems in Blackboard anyway. Use the button "Wissel Video/Slides" to zoom video or slideshow. Button "Toon Hoofdstukken" shows a chapter index. You can jump to another part of the viseo using the chapter list or the white button in the scroll bar. This bar colors gray showing the downloading progress. You can't jump to a slide which isn't downloaded yet. There's a search field on top of the chapter index. You can search for text in the Powerpoint slideshow. This search uses OCR, Optical Character Recognition. The FNWI Multimedia Department strongly recommends to use text and not to use images at the beginning of a slide, to improve the OCR processing. If your head of the Education Department advices course recording and you agreed on this, recordings will be made available as M4V and/or Flash movie. You can display M4V files in Quicktime, Windows Media Player etc. In case you might decide afterwards you don't want the M4V movies and/or Flash files being available, you're allowed to remove the code linking to these files, choosing Course Materials, Video Recordings in Blackboard. Please realise: your students do appreciate the video recordings very much. At https://portal.ru.nl you'll find the new RU portal. Radboud University expects this site to become the main on-line entrance for students. The portal will show the most recent Blackboard announcements, most recent mail, most recent exam results, news etc. Students can add rss feeds, personalize layout, enrol for courses and exams etc. So, as soon as you realize your students do read your Blackboard announcements in the portal, you can stop sending those announcements by e-mail as an extra service on top of the Blackboard announcement service. How do you like the faculty tab in Blackboard anyway? We welcome any ideas on this subject. 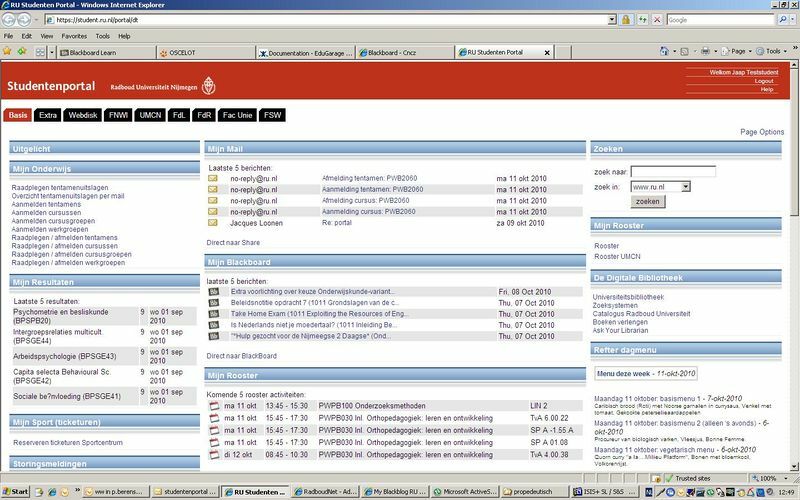 In the follwoing printscreen you can see the student portal of a test student in september 2010, enrolled in courses of all faculties. That's why the faculty tab of all faculties are shown. Module Mijn Blackboard shows the 5 most recent Blackboard announcements. This page was last edited 15:25, 17 August 2017 by Peter van Campen.